There are certain things I don’t miss about France. I don’t miss the wifi that seemed to never work, the lack of air conditioning in French university classrooms, and the distressing frequency with which French pre-teens elect to wear Abercrombie t-shirts. But without a doubt, there are many, many more things that I do miss. I love that the people there who, while being perceived as rude or snobby by their overly-friendly-to-the-point-of-being-annoying American counterparts, embrace their snobbishness confidently and have a sort of quiet elegance to them. I love that you can’t go two streets without finding a boulangerie selling fresh baguette for 80 cents. I love that most French people would rather throw their cat into the Seine than give up their new Chloé Faye clutch and that crocs seem to have been outlawed by an unspoken rule, because despite the unfortunate choices of certain pre-teens, fashion is everything. But mostly, I miss the food. Whilst living in Lyon for four months last fall, I developed a passion for French cuisine. I also developed 10 extra kilo due to said passion, but that’s neither here nor there. 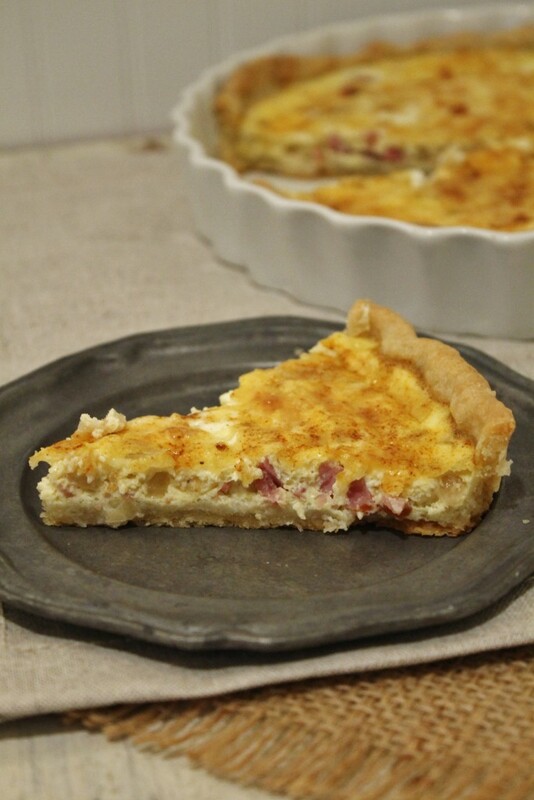 My mother is not French, nor am I, nor is this recipe, but my (completely unbiased) opinion is that it’s probably the best quiche I’ve ever had bar none- including any quiche consumed in France. And trust me, there was a lot of quiche consumed. 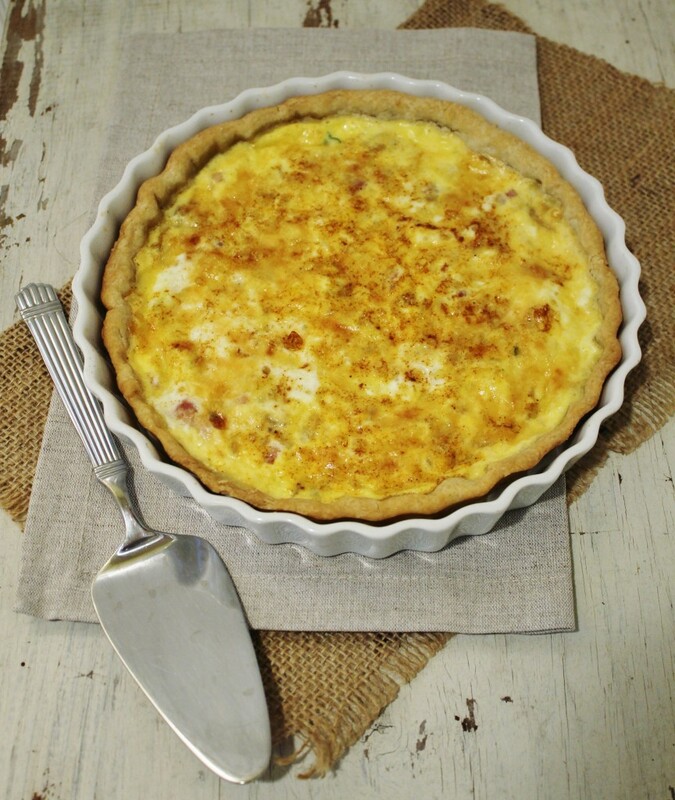 Quiche is one of those foods that is fairly easy to assemble but sounds daunting to make. Impress all your friends with your newfound knowledge of this classic French dish, courtesy of –yet again- mama Leavitt. Oui oui, croissant Jean-Claude baguette. It’s all very French. Prepare your crust: process the first three ingredients in a food processor until the mixture resembles coarse meal. With the motor running, slowly add the water and pulse until the dough just holds together. Flatten the dough into a disk and wrap in plastic. Refrigerate for at least an hour or overnight. In a heavy skillet, sauté the bacon until crisp then remove with a slotted spoon and reserve. Add the butter and olive oil to the pan and add the onions along with salt & pepper to taste. Cook until the onions are very soft over medium-high heat, stirring occasionally. Remove from heat. Prepare the custard: whisk together the eggs, the cream, and the cheese with the remaining flour, salt, and pepper. Add the cooled onion mixture to the egg mixture and stir to combine. Roll out the chilled dough between two pieces of plastic wrap to form a 10” round. Drape the dough over a 9” fluted tart plate and press it lightly into the bottom and sides of the pan, folding the top inward. Prick the bottom of the dough with a fork and blind bake for 10 minutes, using parchment paper and pie weights to keep the crust in place and to keep it from bubbling. Remove the weights and the parchment paper and bake for two more minutes. 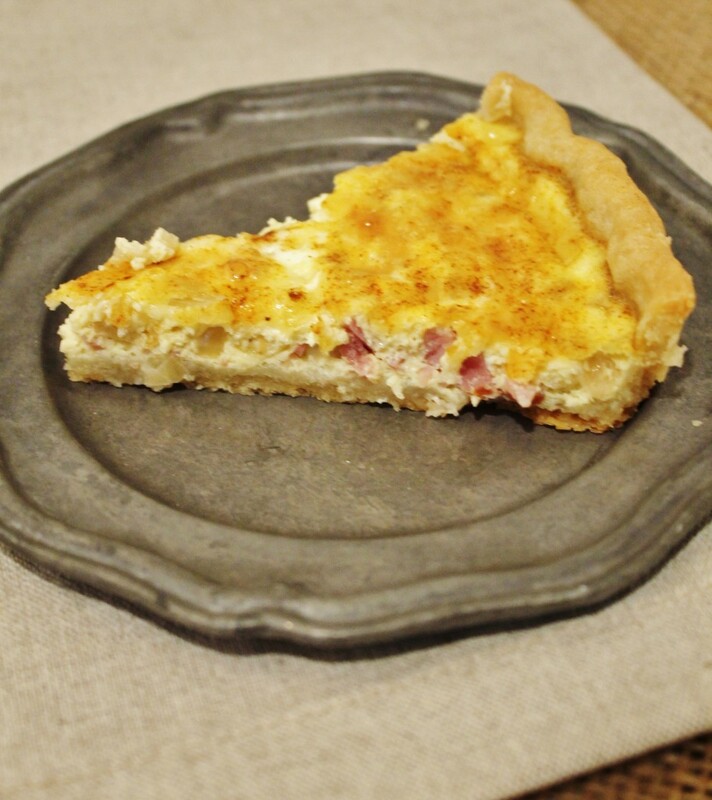 Reduce the heat to 375 °F and remove the quiche shell from the oven. Spread the reserved bacon evenly over the crust and pour the custard mixture into the pie shell. Bake for about 30 minutes, or until the filling feels firm to the touch and the shell is puffed and browned. Place on a wire rack to cool before slicing and serving. Love this! I had this for the first time this weekend at a tea room! tasty! I like this blog. You might too.